Perfect for These lights are perfect for weddings, birthday parties, Christmas, holiday and other gatherings. These are ideal for adding a cozy atmosphere, or a charming and festive accent, to a casual evening. They are also great choice to decorate your patio, gardens, decks, backyards, umbrellas etc. 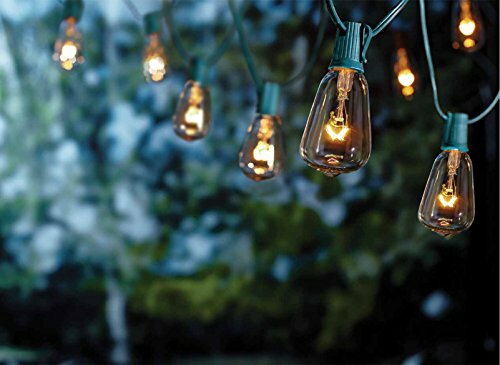 Elegantly designed for interior and exterior lighting, the 10 bulb string of lights will bring and air of awe wonder to your backyard party or next event. We are committed to 100% customer satisfaction.if you have any problem, please feel free to contact with us and we will supply you best after-service. 10 feet long string with 10 clear ST38 Edison bulbs,end to end connectable. Light bulbs have C7 candelabra(E12) socket base, UL listed. Commercial Quality & great for indoor / outdoor lighting applications. Simple and easy-to-use socket loop design allows for hangup and installation anywhere that's desired - hang the string lights in outdoor rafters for backyard, parties and weddings, or indoors for urban inspiration. If you have any questions about this product by Goothy, contact us by completing and submitting the form below. If you are looking for a specif part number, please include it with your message.